Minister of Families, Children and Social Development, Jean-Yves Duclos on January 14, 2019, visited 2nd Canadian Division Support Base Valcartier to witness the delivery of Canada’s new logistics trucks. 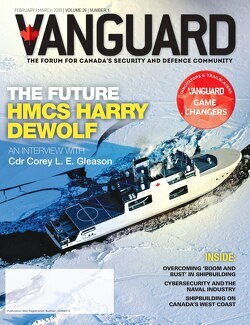 The Government of Canada through the Medium Support Vehicle System (MSVS) project is procuring a new fleet of medium capacity logistics trucks to replace the Canadian Armed Forces (CAF) current fleet of Medium Logistics Vehicle Wheeled (MLVW) trucks, which came in service back in the 1980s. Mack Defense was awarded two contracts in July 2015 – a total value of $834 million – to deliver new trucks, trailers, armour protection systems and provide in-service support. More than 1500 trucks, 300 trailers, and 150 armoured protection systems are expected to be delivered over the next two years to the CAF across Canada. Minister Duclos, in attending the event in place of Defence Minister Harjit S. Sajjan said these trucks, whether deployed for overseas operations or to provide support to local communities like during spring flooding, will help the CAF to get the job done. These types of vehicles are an important part of ground transportation for Regular and Reserve forces. They provide support to “nearly every domestic and international CAF operation, moving critical equipment, personnel and supplies to wherever they need to be,” according to a press release. About 450 of the trucks purchased will be based in Quebec to be used by CAF units, including Reserves. The trucks are in “five variants ranging in use and size from regular cargo to cargo trucks with a material handling crane.” Through the MSVS project, Militarized Commercial Off-The-Shelf (MilCOTS) trucks, Shelters and Kitting of Shelters are completed, while Standard Military Pattern (SMP) trucks and minor infrastructure upgrades are ongoing. The new trucks can carry up to 9.5 tonnes. Mission preparedness: Are we making the necessary investments? Can these two men predict the future?